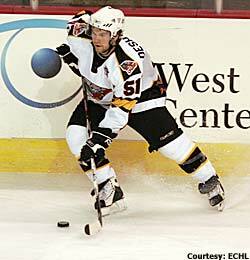 current ECHL scoring leader with 20 goals and 78 points, and led his team to a 17-game win streak. When Cincinnati Cyclones coach Chuck Weber was informed by the Montreal Canadiens at the start of the season that he would be receiving rookie center David Desharnais, the immediate thought was strictly about his offense. But the 21-year-old has provided much more for the top team in the North Division. Not only does the 5-foot-6 Desharnais lead the ECHL in scoring with 78 points (20 goals, 58 assists) in 53 games, but his defensive prowess had guided him to a remarkable plus-32 rating. His play helped the Cyclones win a league-record 17 consecutive games, a stretch that finally came to an end in Stockton on March 1. "He's a kid that we thought could come in and produce offensively," Weber said. "But what's really impressed me is his attention to detail, both offensively and defensively. He's improved so much this year with the defensive side of things. He's a kid that whoever you put with him becomes a better hockey player." Desharnais told NHL.com that he had a sitdown with Weber prior to the start of the season. It was during that meeting when the Cyclones coach informed the Canadiens' prospect that his main goal for the 2007-08 campaign should be to improve his defensive game. And while Desharnais, a Quebec native, is proud of the fact that he leads the ECHL in scoring with 19 games to go in the regular season, he admitted he takes a ton of pride in the fact that his plus/minus rating is as high as it is. Remarkably, he ranks second on the Cyclones in that department. Cincinnati defenseman Chad Starling is a plus-41. "Honestly, I'm pretty impressed with that," Desharnais said of his plus-32 rating. "When you're on a winning team, it's easy to have some plus in the bank. But I'm pretty impressed with that. At the beginning of the season, Coach told me the thing I had to work on was my defensive side. I've always been not that bad on defense, and I'm showing it right now." Despite his small frame (5-6, 177 pounds), Desharnais is showing he can play with the big boys. Weber raved about the rookie's work ethic, and even went as far as to compare him to Martin St. Louis, a former Hart Trophy winner who bounced between the Calgary Flames and their AHL affiliate before finding a permanent home with the Tampa Bay Lightning in 2000. "If he was four inches taller, he's in the National Hockey League," Weber said. "Unfortunately, I don't think some people can get over the fact he's 5-6. If people could overlook that, I think there's another potential Martin St. Louis. It took him a little time to play in the minors before he got his break. It could be the same situation with David, just because of how hard he works. His creativity offensively is unbelievable." After going 38-70-108 with the Chicoutimi Sagueneens of the Quebec Major Junior Hockey League last season, Desharnais made the huge leap to the Bridgeport Sound Tigers in the American Hockey League. He had a goal and an assist in seven games and signed a deal with the Canadiens over the summer. "It was pretty tough to go to a team that you don't know anybody," Desharnais said. "You don't know the system or anything. The guys don't like you because you're taking their place. It was pretty tough. I just had a couple of games to be good, so it was pretty good. Everybody needs a couple of games to adjust themselves. At the beginning of the season here, that's what I did. I'm just playing to help my team win." Despite his phenomenal numbers with the Cyclones, Desharnais has appeared in only four games for the AHL's Hamilton Bulldogs this season. Desharnais, who had one assist at the Triple-A level, could receive more of an opportunity elsewhere next season if he does not return to the Canadiens' organization. But Weber made it clear he will voice his opinion over the summer. "Hamilton's so deep at forward this year," Weber said. "I think that's been a little bit of an issue. It would be my recommendation to them to not let him go. I think the kid has too much talent. He's going to get stronger. He's only 21. I think he's going to be even better next year. "There's been a lot of people who have called about him," Weber added. "If they didn't know he was under contract, they do now. He's had some success on a successful team. He's been a huge contributor. He's a guy you can count on every night, offensively and defensively." Desharnais admitted he would have enjoyed more time in Hamilton, but is pleased with the way he's developed in Cincinnati. The Cyclones are in tremendous shape to have home-ice advantage for at least the first two rounds of the Kelly Cup Playoffs. "Maybe it's good for me that I stay here," Desharnais said. "I didn't miss too many games. Maybe it's going to be good for next year. We're pretty confident. We won 17 straight games. We're going to be tough to beat. We have to be ready. We're going to be ready for the playoffs." And if Desharnais should perform in the postseason the way he has through the first 53 games of the 2007-08 campaign, it's hard to fathom him not receiving every opportunity to start next season in the AHL. "Guys in the AHL and the NHL look for winning teams and winning guys," Desharnais said. "I think it helps everybody to be on a winning team and to be part of that success. It's something that the AHL and NHL are looking for." "I think if he continues the season he's having and puts together a strong playoff run, he's just going to continue to open more eyes," Weber said. "He's strong on his skates, he battles. He's willing to take a hit to make a play. He's got a great work ethic."